Talk hosted by the Blum Center at UC Santa Cruz and Bookshop Santa Cruz fills UCSC's Multi-Purpose Room. Over 400 people, including students, faculty, staff and community members, packed the Multi-purpose Room at Colleges Nine and Ten to hear Nobel laureate and “banker to the poor” Muhammad Yunus speak. Photos by Steve Kurtz. “Professor Yunus’ new book, A World of Three: The New Economics of Zero Poverty, Zero Unemployment, and Zero Net Carbon Emissions - is precisely what we need right now - a compassionate call to action,” said Heather Bullock, a UCSC psychology professor and director of the Blum Center, in her opening remarks. 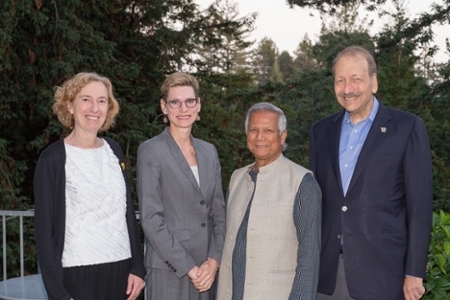 ﻿Dean of the Social Sciences Division, Katharyne Mitchell, Campus Provost/Executive Vice Chancellor Marlene Tromp, Muhammad Yunus, and Chancellor George Blumenthal. “Poverty was not created by poor people. It was created by economic institutions and social systems,” said Yunus, who won the Nobel Peace Prize in 2006 with Grameen Bank, a community development organization he founded that has transformed banking for impoverished communities across the world (there is even Grameen America, with branches across the state including four in California). Yunus pioneered the concept of microfinance, a type of banking that provides low interest loans to people lacking the conventional resources to start their own business. Yunus’ latest book, A World Of Three Zeros: The New Economics Of Zero Poverty, Zero Unemployment, And Zero Net Carbon Emissions (Public Affairs, 2017), formed the basis of his talk. In his book, Yunus proposed a new concept to transform capitalism: social business. Yunus defined social business as a non-dividend company dedicated to solving human problems. When businesses put the needs of people over profit–such as feeding hungry children, providing shelter to the homeless, curing a diseased population–economic and environmental problem will be solved. 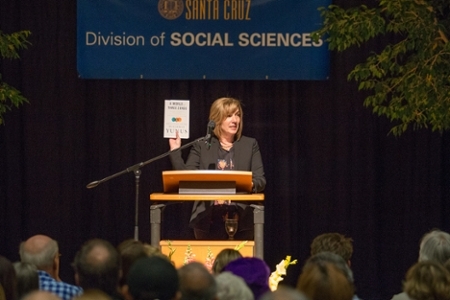 “Poverty, concentrated wealth, and rising inequality are among the most pressing problems facing us, and Professor Yunus and his work embodies all that we strive to do at UCSC’s Blum Center,” said Heather Bullock, a UCSC psychology professor and director of the Blum Center, in her opening remarks. Social business can alleviate the urgent issues of our time, said Yunus. Wealth concentration, environmental degradation, global poverty, healthcare and education disparities can be eliminated when people, and not profits, are put first. “Since the problems we face are made by humans, they can be solved by humans,” said Yunus, who is optimistic about the collective potential of social entrepreneurship. Instead of thinking like job seekers, think like a job creator urged Yunus, whose revolutionary approach has lifted millions out of poverty and into self-sustaining jobs. “We share Professor Yunus’ belief that a poverty-free world is possible,” said Bullock. “Poverty reduction is about fixing systems not people,” added Bullock about the vision the Blum Center shares with Yunus. Yunus has helped more than 8 million borrowers (97% of whom are women) launch their own business with microcredit provided by Grameen Bank. Yunus cited extraordinary evidence demonstrating its impact. The World Bank estimated the poverty level in Bangladesh was 74% in 1973. By the early 1990s it shrank to 57%. In 2000, 49%, 2005, 40%. And by 2016? 12.9%. In other words, as microfinance grew, poverty in Bangladesh shrank. “Each year the number gets smaller,” said Yunus. By opening lines of credit, poverty can be sustainably alleviated, Yunus emphasized. But microfinance and social business is distinct from philanthropy and charity, which he argued has limitations. “Charity goes out but does not come back,” Yunus pointed out. Under a social businesses framework, the objective of charity is met. 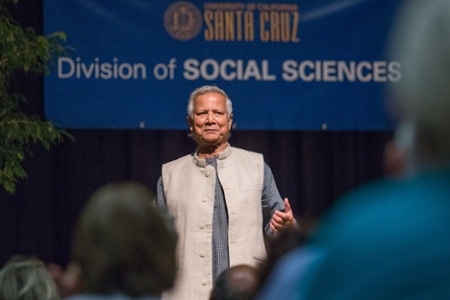 Unlike "one-time giving," social entrepreneurship is limitless, said Yunus. Because it builds on the best practices learned from business, a perpetual revenue stream is created. In Yunus’s vision, economies flourish when capital flows. And when that capital is invested in ideas with social purpose, more needs are met, more people are helped, more dreams are realized. The UC Santa Cruz Blum Center is part of a network of centers working on poverty across all ten University of California campuses. The center brings together diverse stakeholders to advance economic justice, reduce poverty, and increase access to affordable housing and nutritious food. Learn more: blumcenter.ucsc.edu.